I am standing on the roof of the new extension at the Tate Modern, surveying the glorious view from The Blavatnik Building on London’s Southbank at the beginning of the May Bank holiday weekend. The Sun is hitting my face warm and strong, as I gaze out across the River Thames towards St.Pauls Cathedral the City Skyline stretches out in all directions, I cannot help but think that London is a special place to find yourself. Now Tate Modern to be honest is the kind of place which makes me feel just the weeniest bit uncomfortable. It begins at the bag check, where I am convinced I look dodgy, so over compensate by being super friendly to the security staff, then I imagine they not only see through my dodgyness ruse but also work out that I am an artistic philistine, the kind of visitor that stands there and stares at a piece and thinks to himself wtf is that all about? In short an Art ruffian who should be immediately frogmarched from the building. But it’s ok, I’ve learnt to keep my head down and not give away the fact that I inhabit an Artistic wasteland, instead I wander through the galleries doing my best to appear as though I am in my natural element, the Urban or Urbane silver fox out and about. I end up at a workshop with an Artist in residence, it forms part of a group of shows titled somewhat obscurely ‘Producing Memory: Maps, Materials Belongings. There are a series of clothes lines in the room, suspended along them by laundry pegs are A3 white sheets of paper, each with a sketch and a few paragraphs of writing, each in thick black ink, hung out to dry. The pieces are by the artist Sophie Herxheimer. 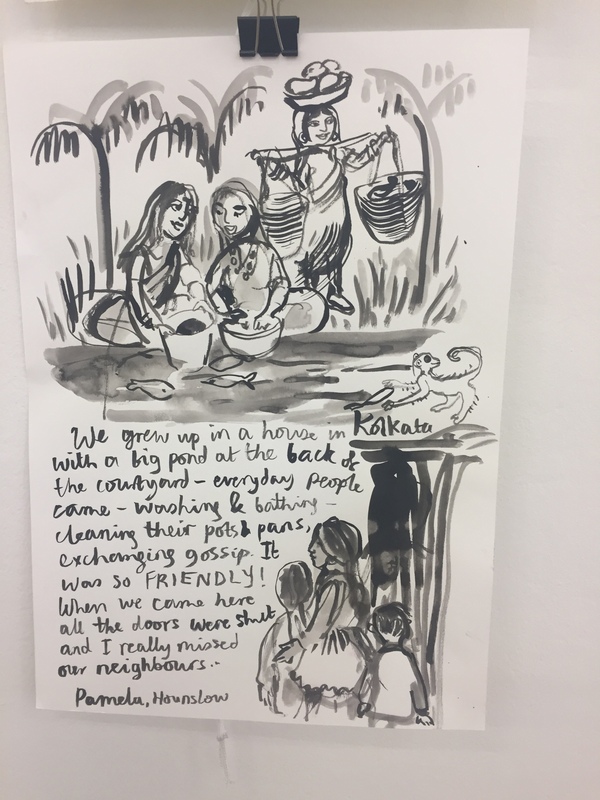 Sophie sits at a large table, with her materials, opposite her, each few minutes a visitor to The Tate sits and talks to Sophie, each shares vignettes of their lives & experience with the Artist and she translates each story into text and image. I have recently been very struck by the amount of press about immigration, how often in newspaper text that it becomes a theoretical statement, faceless, just figures in newsprint that its difficult to imagine having real lives. People described in numbers, or ethnicities, somewhere in that process its hard not to lose sight of humanity. Now, in this corner of the Tate an idea simple enough, takes on its own life, each story painted becomes real and warm and alive. I stand and look at sheet after sheet hanging there on the lines, so many different souls passing through, who’ve made London home, who’s parents made it home, who are passing through, from all over the world, they tell their stories, of the places they left behind, of the memories they carried with them, of the lives they are building. I sit and watch Sophie with one of the visitors as the process plays out. At the end of the session the sitter gets up to leave, as I look at her face I see a young Indian girl wiping tears from her eyes. The Artist meanwhile moves on to working with the next visitor and the next story. The A3 sheet from the Indian girl is placed to dry on an adjoining surface, filled with curiosity I saunter over to it. As I look at the drawing and read the text I get a lump in my throat and feel tears welling in my eyes. I slope off to a corner of the gallery without people so that I don’t get caught being a soppy old tart. Time and again I stop to read one after another of the workpieces, fascinating snippets, fascinating stories, spanning years of experiences across many countries, all coming to London. 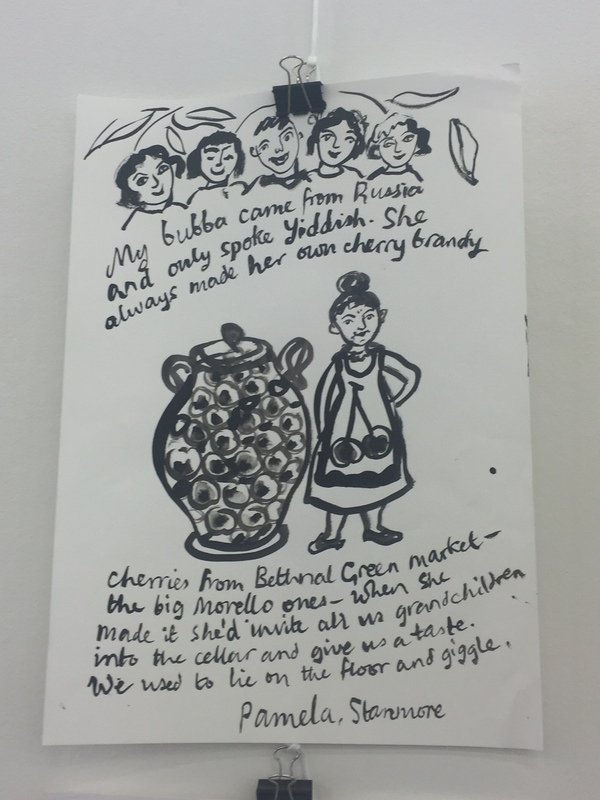 Sophie the Artist is the child of a Jewish emigre who escaped Nazi Germany in 1938 & settled in London. She is working in the Blavatnik building, paid for by a Billionaire Philanthropist born in Odessa, the former Soviet Union, who made London home. The glaringly obvious fact for me is that London could not exist as it does without all of those people who have come here over time, London is the people who make it, far more than it can be called the Capital of England, or a major city, it is a home and a life for all those who come here and in their coming they give the City life. I walk along the Southbank in the sunshine, hundreds of people out and about, just enjoying being, the sounds of many languages drifting on the breeze as I walk, my eyes witness to every hue of skin walking like me in the sunshine. Most of all the thought pervades that I am just another one of the many who came here, to London to make it home.